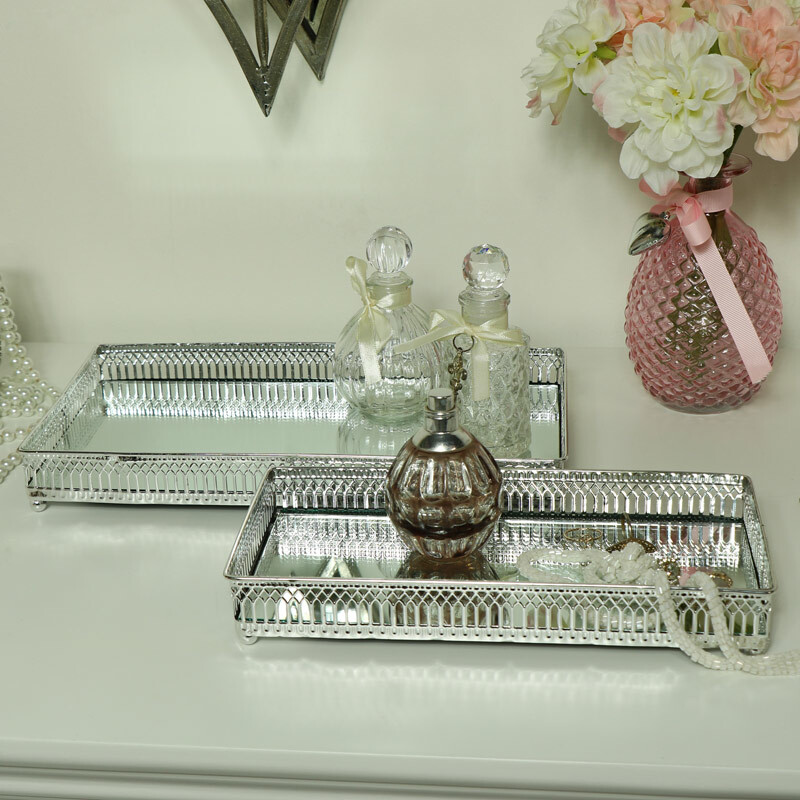 Pair of polished silver metal mirrored display trays. Stunning cocktail trays for a vintage home decor or wedding accessories. In 2 sizes with silver filligree frame surrounding the mirrored surface. Use as a pair or individually for a gorgeous look. With more trays in various styles, colours and sizes. 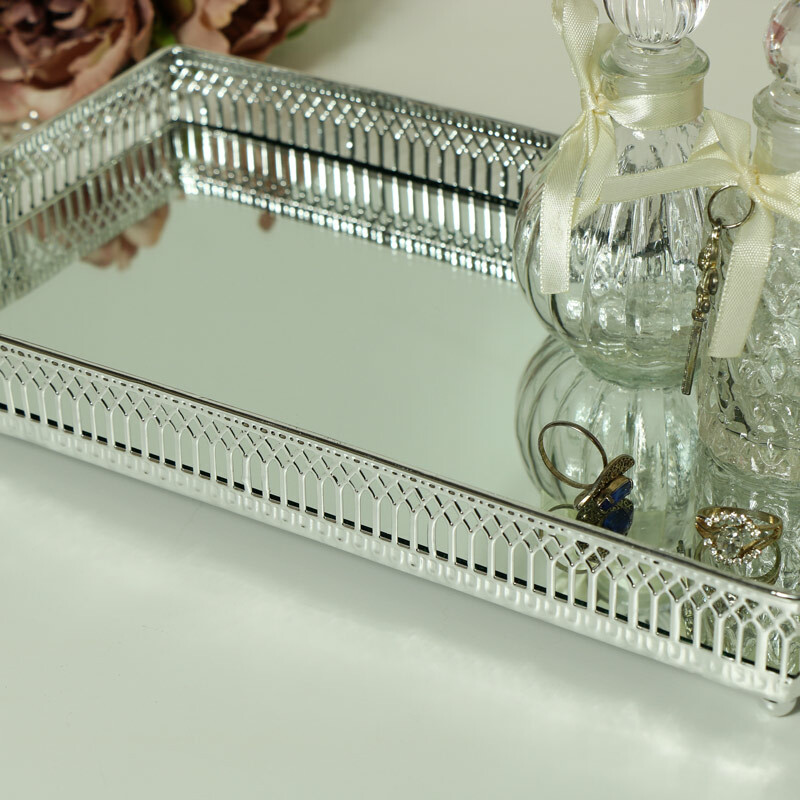 Perfect for displaying ornaments, trinkets, candles or those favourite perfume bottles. Pair of polished silver metal mirrored display trays. Stunning cocktail trays for a vintage home decor or wedding accessories. In 2 sizes with silver filligree frame surrounding the mirrored surface. Use as a pair or individually for a gorgeous look. With more trays in various styles, colours and sizes. Perfect for displaying ornaments, trinkets, candles or those favourite perfume bottles. Silver nickel plated frame with a mirrored glass surface. The large tray measures 30.5cm x 4cm x 17cm (width x height x depth) & smaller tray measures 25.5cm x 4cm x 12.5cm (width x height x depth).